The Sirma Mobile's communication platform provide complete solution for developing mobile services based on Motorola's iSIM technology by taking burden to adhere to cryptic GSM standards and allowing developers to focus on service they want to provide. Automatic update of iSIM applications without user interaction. 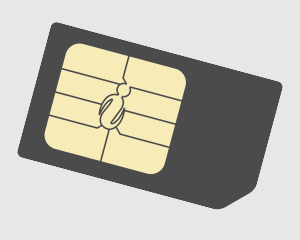 Update process is compliant with GSM 03.48 and Global Platform standard and can be used on any SIM card. Communication platform keeps track on every iSIM along with all applications and services installed on it. Updating given application on one or several iSIM is just one click away from you. 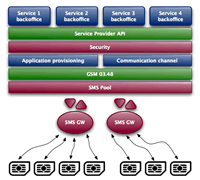 Platform establishes secure channel for communication between service provider's backend and iSIM applications. Security is based on industry strength proven GSM 03.48 standard. WebServices for integration with backend. SMPP v3.3 and v.3.4 support. ... or any other idea you would like to bring to life. Motorola iSIM (intelligent SIM) is a flexible and powerful platform that helps mobile operators and enterprises to enable mobile lifestyle experiences effectively and efficiently. iSIM empowers service providers with ease, flexibility and freedom to implement compelling end-user applications services in a cost-effective manner and to drive adoption. Motorola's iSIM is based on a flexible 0.4mm wafer that can be attached to the subscriber's original SIM providing additional services. They can be controlled via SIM toolkit (STK) allowing third party developers to build applications and services. iSIM build-in NFC chip based on Philips/NXP standard support both NFC and non-NFC application running on iSIM.